Above: South Carolina dairy farmer Marilyn Easter speaks at the South Carolina School Nutrition Association conference. “Farm to table,” “farm to school” and “organic or conventional” are common phrases heard in today’s conversation about food. Agriculture is a hot topic, as consumers want to know more about where their food comes from. SUDIA has worked for many years with schools, health professionals, retailers, dairy processors and the public to promote dairy foods throughout the Southeast and is here to help you identify your role in a changing food world. 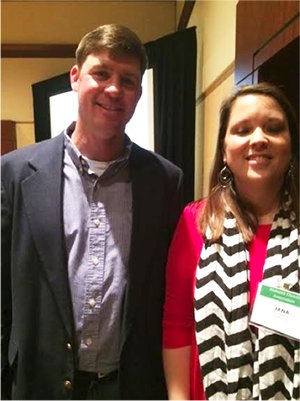 Alabama dairy farmer Will Gilmer (left) and SUDIA Manager of School Health and Wellness Jana Miller speak to Alabama child nutrition directors. Learning how dairy farmers produce healthy, high-quality foods by being committed to animal care, quality standards and being good stewards of the land is relevant to what school nutrition professionals do every day—giving students access to healthy school meals. 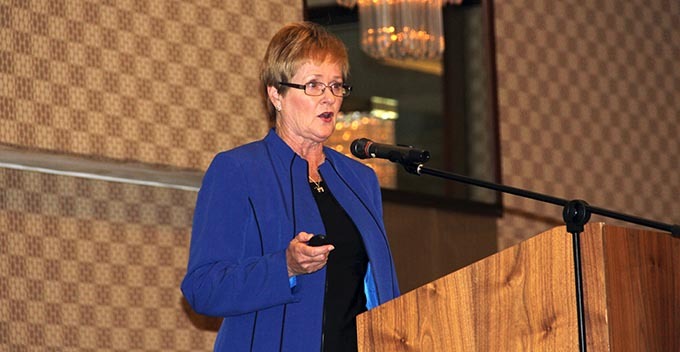 As nutrition and wellness professionals, all of us need to do more to boost awareness about how agriculture and sustainability are intricately connected to nutrition and health. Some of our Southeast dairy farmers are doing just that. At the Alabama School Nutrition Association/Child Nutrition Directors spring conference, Alabama dairy farmer Will Gilmer joined SUDIA school nutrition staff to present “Understanding Agriculture 101: Leadership in a Changing Food World,” which focused on promoting the cause of farming and agriculture in today’s sensitive food landscape. If you are interested in hosting a local dairy farmer for your state SNA conference or regional meeting, contact your SUDIA representative.